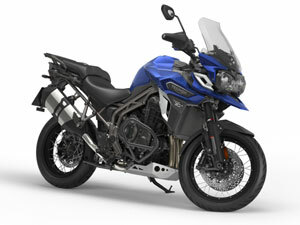 Triumph Motorcycles, the iconic British super sports motorcycle brand, on Tuesday introduced its new Tiger Explorer XCx adventure bike in Asia’s third biggest economy to expand its range and boost sales. Rs 18.05 lakh Ducati Multistrada Enduro and the BMW R1200 GS Adventure priced between Rs 17.8-21.8 lakh, in Indian market. Internationally, the Tiger Explorer was updated in 2016 and is available in as many as eight variants, including two low seat options spanning the road-oriented XR and off-road oriented XC range, just like the Tiger 800. In India though, Triumph will limit sales to just the Tiger Explorer XCx variant and sales will be limited to just 20 units across India. Significantly, the XCx model offers better off-roading capabilities along with the same impressive on-road ride experience. The bike is offered in three colour options – Jet Black, Crystal While and Lucerne Blue. The XCx is the top-end, off-road oriented model in the Triumph Tiger range of adventure motorcycles and comes with durable wire spoke wheels and hi-end electronics. Aesthetically, it carries the same silhouette of the outgoing model. However, there are lots of minor changes in the design, providing it with a sharper and more rugged appearance than its predecessor. The new bike is powering by a 1,215cc, in-line three cylinder engine with revised tuning. The updated Euro-IV/BS-IV motor makes 137PS and delivers a torque of 123Nm, both more than the outgoing version. Like its rival, the BMW R1200GSA, the Tiger Explorer uses shaft drive for low maintenance and a smooth delivery of power to the rear wheel. New for this model, semi-active suspension is available on the XRx, XRt, XCx, and the XCa models and braking is taken care of by new radially mounted Brembo monoblock calipers. The Tiger Explorer XCx gets shaper styling and more muscular looks, although the overall silhouette remains the same as the outgoing model. Like the outgoing model, the Tiger Explorer comes with a shaft final drive, but gets a torque-assist clutch. “The Triumph Tiger family has been pivotal in building the adventure riding category and culture in India,” Vimal Sumbly, managing director at Triumph Motorcycles India told Financial Chronicle. With over 800 customers in the country, Triumph does not just deliver great motorcycles, the brand also create an ecosystem in which the rider is equipped with the skill sets to ride deftly and safely, he pointed out. “Our initiatives like the Triumph Tiger Trails and our Tiger Training Academies stand testament to this. As the pioneer in this category, the remarkable Tiger Explorer XCx with its state-of-the-art features and rider focused technology is suited for both on and off road riding, ensuring superb stability and control,” Sumbly boasted. It is a bike that allows riders to tailor their desired adventure, to go anywhere and everywhere from the daily commute to the corners of the earth, he said. The new Tiger Explorer XCx features an electrically adjustable windscreen and a semi-active suspension for better long ride experiences. The electronic package receives ride-by-wire along with a choice of riding modes (Road, Rain and Off-Road) as well as a programmable Rider mode to save specific settings. The bike also gets cornering ABS, traction control and a new inertial measurement unit (IMU) that assists for better control. The new IMU calculates lean angles to deliver traction and braking power accordingly. The new Triumph Explorer XCx is designed to excel off-road. The XCx model is more than capable of performing in any environment. It offers an unprecedented level of equipment and technology to provide a motorcycle completely prepared for any adventure – no matter the distance or destination.